Taught by Morwenna Assaf and Walid Assaf (two hours). Morwenna will explain about the Lebanese style and explain how it is different from Egyptian Raks Sharqi and other styles. She will also cover what other styles of Lebanese dancing there are besides debke. And she will get us all dancing like a Lebanese. Accompanied by live drumming of Walid Assaf. Taught by Seyyide Sultan (one hour and a half). 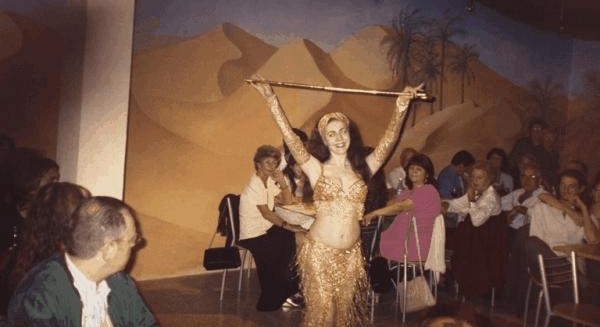 The Egyptian art of dancing with a cane, saidi style. No previous experience with cane required, but a cane will be needed. We will go over technique for handling a cane, and additional technical aspects of dancing with a cane, building up to a short choreographic sequence applying this style. Connecting to the feelings with audience and the feelings in Arabic music. Explanations: what it is and what it is not. Dance exercises applying the concepts. This is NOT a choreography workshop. Registration for the workshops will go on a first-come first-served basis, space is limited. Registration is non-refundable.